Deliberations on a proposal that aims to slow growth in Texans’ property tax bills stalled Thursday after hours of private meetings between leadership in the two chambers. The House and Senate both adjourned for the day without taking up the high-priority legislation. The House said it plans to take up the bill again on Monday. "Members, we are respectfully working with the Senate on this issue,” House Speaker Dennis Bonnen, R-Angleton, told the lower chamber after the decision to delay was announced. Nearly four hours later, the Senate adjourned for the weekend without bringing up the measure in what seemed to be an acknowledgement that the upper chamber’s tax champions had failed — at least for now — to secure the 19 votes they need to bring the bill to the floor. On Thursday morning, as speculation raged over which chamber would lead Thursday’s charge on the tax bill, Lt. Gov. Dan Patrick told Lubbock radio host Chad Hasty that he was “working towards” bringing the measure to the Senate floor. Thursday’s expected debate seemed to stall thanks to two major sticking points: school districts — how should entities that levy the bulk of property taxes in Texas fit into the broader property tax reform equation? — and how much local entities’ property tax revenue should be allowed to grow annually without the approval of voters. The proposed election trigger in both chambers’ versions of the bills is currently 2.5%. State Sen. Kel Seliger, the Amarillo Republican — who is, at least according to Patrick, the only Republican holdout — has called that figure “punitive” for local governments. After hours of negotiations Thursday, including a private meeting with House Speaker Dennis Bonnen, Seliger confirmed he remains opposed to SB 2 in its current form. In January, when identical versions of House Bill 2 and Senate Bill 2 were filed, the rollback election trigger applied to school districts, cities and counties. But state Rep. Dustin Burrows, R-Lubbock, stripped schools from the rollback rules from the House version he authored, angering some conservatives. On Thursday afternoon, as an attempt at negotiations were happening behind the scenes, Gov. Greg Abbott seemed to pick a side. “Regardless of which bill this cap is placed in, limiting school districts ability to raise property taxes is essential to achieve lasting property tax reduction,” said John Wittman, a spokesman for the Republican governor. But it's unclear exactly what format Abbott wants this tax cap to take, and the answer could have large ramifications for whether school districts are funded equitably and how much the state must reimburse them. 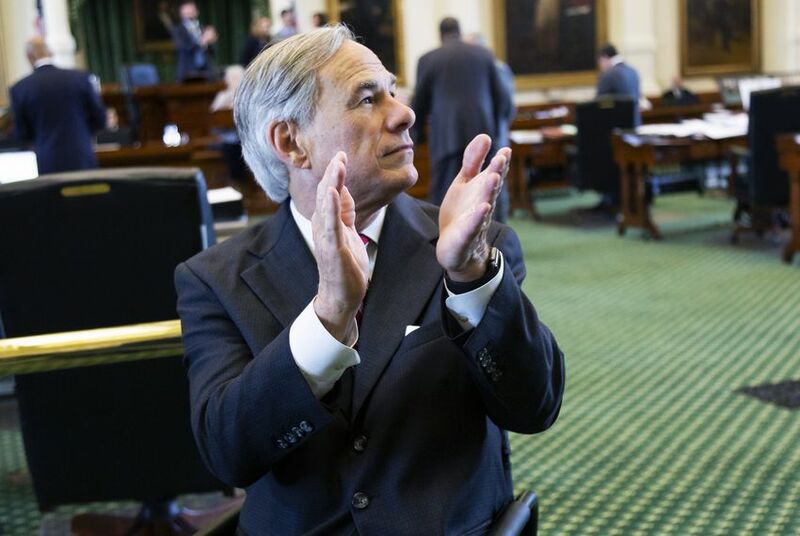 In the months before the legislative session began, Abbott proposed capping individual districts’ property tax revenue increases at 2.5% and having the state make up the extra funding they were entitled to. That could mean fast-growing school districts with skyrocketing property values would receive more state funding and tax at a lower rate, while districts with static property values would not see much more state funding or changes in their tax rates. School finance and tax experts pointed out that mechanism would lead to an inequitable school district funding system. Lawmakers could also choose to continually lower tax rates for all school districts by the same amount, while making up the lost money for districts. Last week, state Rep. Dan Huberty, R-Houston, considered amending his school finance bill to do this, paying for the decrease in tax rates using money generated from local property value growth above 2.5%. But he decided not to because he said lawmakers didn’t have the money needed to compensate school districts for the lost funding. “I filed this amendment to show how we could provide continual property tax compression in all districts statewide, but we are pulling it down at this time, because we do not currently have the revenue available to us,” he told House lawmakers before they voted on the school finance bill. That bill would lower school districts’ property taxes by 4 cents per $100 valuation statewide — saving the owner of a $250,000 home about $100 a year — which some of the House’s more conservative members have argued isn't sufficient. Those conservatives have also argued that language relating to school districts should be placed back into the property tax legislation for “meaningful” relief. Though attempts to advance the priority reform bills failed on both sides of the Capitol, the prolonged negotiation period let supporters air new ideas that could help bring reluctant lawmakers into the fold. Most Democrats and local leaders have balked at the 2.5% election trigger, calling it untenably low and notably less than the proposals for a 4% or 6% threshold that deadlocked the Legislature in 2017. An amendment filed by Burrows, which appeared to gain traction Thursday, could prove more palatable. Burrows, who chairs both the tax-writing Ways and Means Committee and the House GOP caucus, has proposed striking the flashpoint 2.5% figure and replacing it with an election trigger tied to inflation. A one-page summary of the amendment — complete with a mathematical equation explaining its function — says the provision would yield a “flexible” trigger that can follow the “ebbs and flows of the economy.” Burrows’ office projects it would have resulted in rollback rates between 2.5% and 4.94% over the last decade. Still, state Rep. Chris Turner, chair of the House’s Democratic Caucus, said the postponement hopefully meant a “sincere policy discussion” would take place on the bill.